Julia Meech-Pekarik wrote "In another print by Chikanobu dated November 1887 the prince encourages his playmates to enjoy rough-and-tumble outdoor winter sports, but he stands aloof on his front porch, not quite one of the boys... Even his costume sets him apart; it is a miniature replica of the military uniform worn by his father [the Meiji emperor], who is seated int he parlor." Quoted from: The World of the Meiji Print: Impressions of a New Civilization, page 128. Illustrated on page 129. 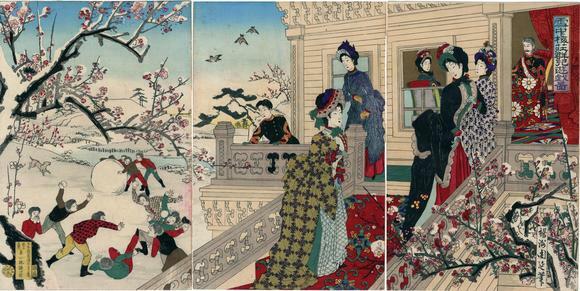 This triptych is also illustrated in Orientalism: Visions of the East in Western Dress by Richard Harrison Martin and Harold Koda, Metropolitan Museum of Art, 1994, p. 74. However, this image is incorrectly reproduced in reverse. The name of the publishing house printed in the large vertical cartouche in the lower left corner is Kobayashi Tetsujirō. This is actually the family name of the publishing house Maruya Tetsujirō (Marks 300). Illustrated in color in The Art of Japan, China and Korea in Russian (Искусство Японии, Китая и Кореи) by Irina Novikova, 2017, p. 333.